A chilled crust of chocolate, coconut and pecans is filled with scoops of ice cream and crowned with sundae toppings for the ultimate frosty pie. Line 9-inch pie plate with foil; lightly grease foil. Microwave chocolate and butter in large microwaveable bowl on HIGH 1-1/2 min. or until butter is melted, stirring after 1 minute. Stir until chocolate is completely melted. Stir in pecans and coconut. Spread evenly onto bottom and up side of prepared pie plate. Refrigerate 1 hour or until firm. Lift crust out of pie plate. Carefully peel off foil. Return crust to pie plate or place on serving plate. Fill with scoops of the ice cream; cover. Freeze 2 hours or until firm. Top with whipped topping and cherries just before serving. Store leftover pie in freezer. 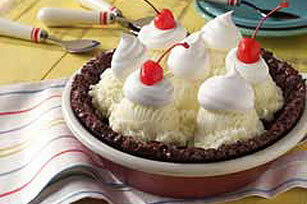 Enjoy a serving of this rich and indulgent pie on special occasions. Remove pie from freezer. Let stand at room temperature 10 min. before serving to allow pie to soften slightly for easier cutting.